"These are tasty, tender chicken pieces with our own spicy horseradish dipping sauce. We serve it with our favorite potato salad and corn on the cob. Enjoy!" Place flour in a shallow bowl. Place breadcrumbs in a separate shallow bowl, and mix with ground black pepper and cayenne pepper. Place eggs and water in a small bowl. One piece at a time, coat the chicken in the flour, the eggs and the bread crumbs, and set aside. Heat oil in a deep fryer to 375 degrees F (190 degrees C). In small batches, fry chicken 6 to 8 minutes, or until golden brown. Remove chicken, and drain on paper towels. In a separate small bowl, combine the mayonnaise, horseradish, sour cream, Worcestershire sauce and mustard. Mix well, and serve with the chicken for dipping. 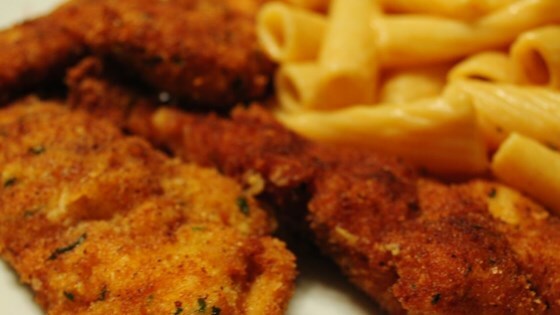 See how to make tender breaded chicken fingers with dipping sauce. Not very flavorful, if I would make again would use more spices. These came out great! I also pan-fried with no trouble! I love this recipe! I had some tenderloins and had no idea how to prepare them. No more forzen nuggets for us! receipe is very good, a little bland, added 1 tsp garlic pepper, and 1 tsp poultry seasoning. Would use again. my kids and husband loved these! These will be made in our home A LOT!